When we think of Valentine's Day, we usually think of the romantic love between couples. But I think we should also celebrate the love we have for all the special people in our lives. Family, friends, and even those we cherish in our memories. My grandparents, my in-laws, and many others whom I have loved are gone. But they live in my heart every day. 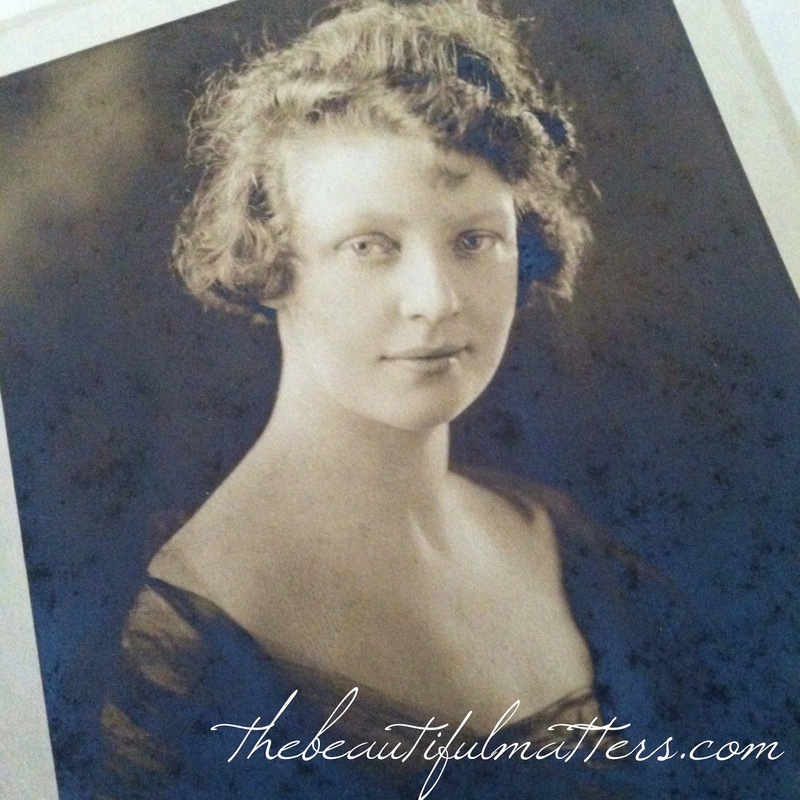 And I am blessed to have inherited many, many beautiful things from each of them so I have something tangible to remember them by, as well as these beautiful old photographs. So in honor of their memory, I am setting a special table today using things that were passed down to me from them. This elephant belonged to my husband's great-grandparents, who lived in Africa for a while. The tusks are real ivory, now banned for sale in most countries because of concerns for endangered elephants. My husband's grandmother Jean, who came over alone from Scotland to stay with relatives in Montana. 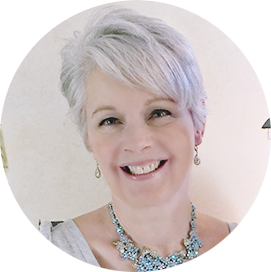 She met her future husband on the boat, however, and didn't stay in Montana long before joining him in Detroit. She always referred to the place in Montana as a "one-horse town." 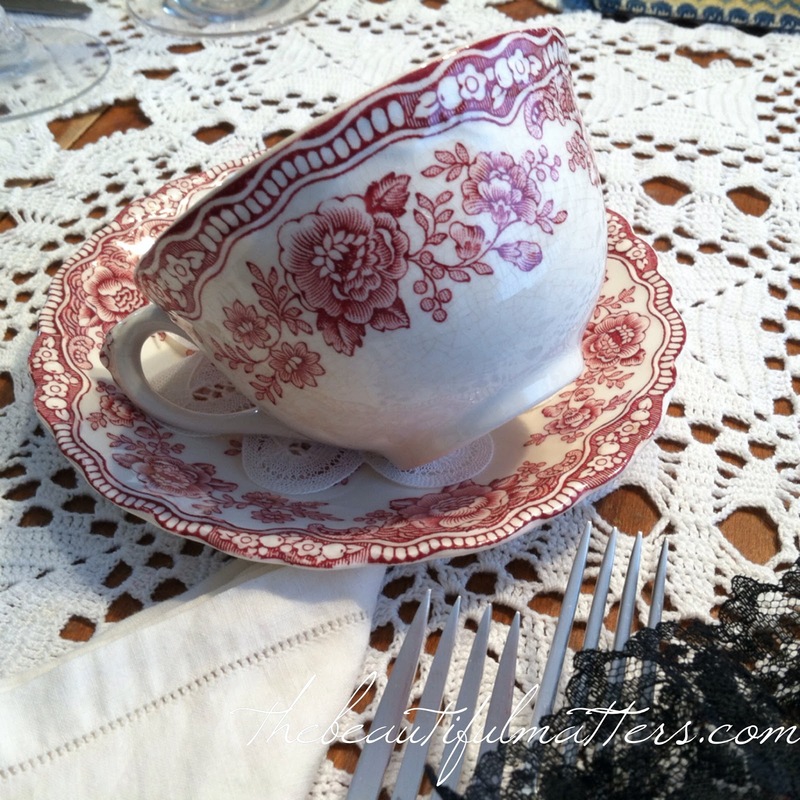 My grandmother's red transferware, Crown Ducal "Bristol." She also embroidered this lovely tablecloth. 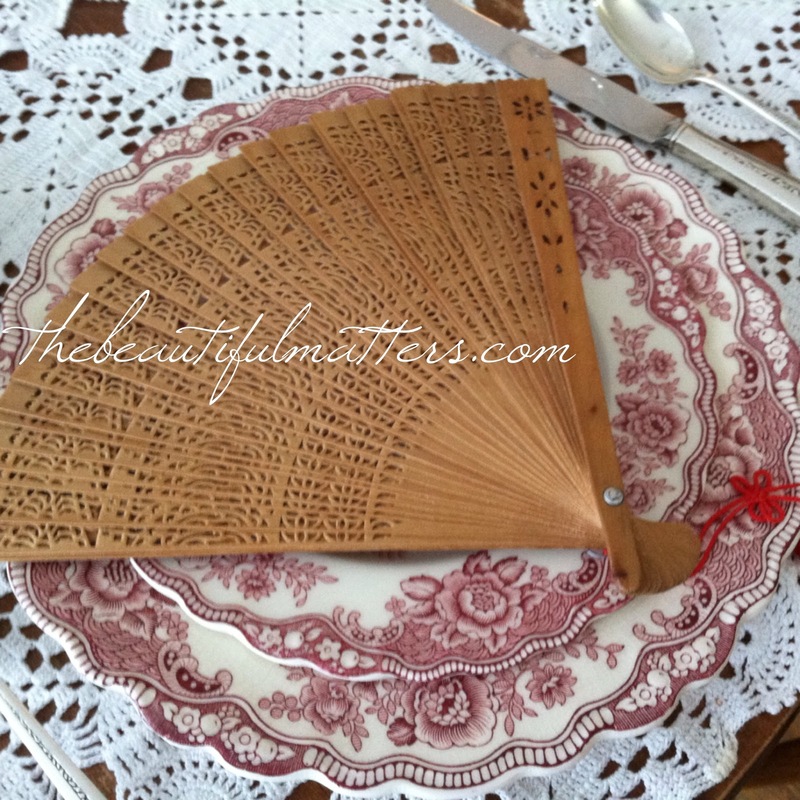 One of a dozen or more antique fans from my grandmother's collection, which I inherited. The one below is carved from sandalwood, and smells lovely when I fan myself with it. 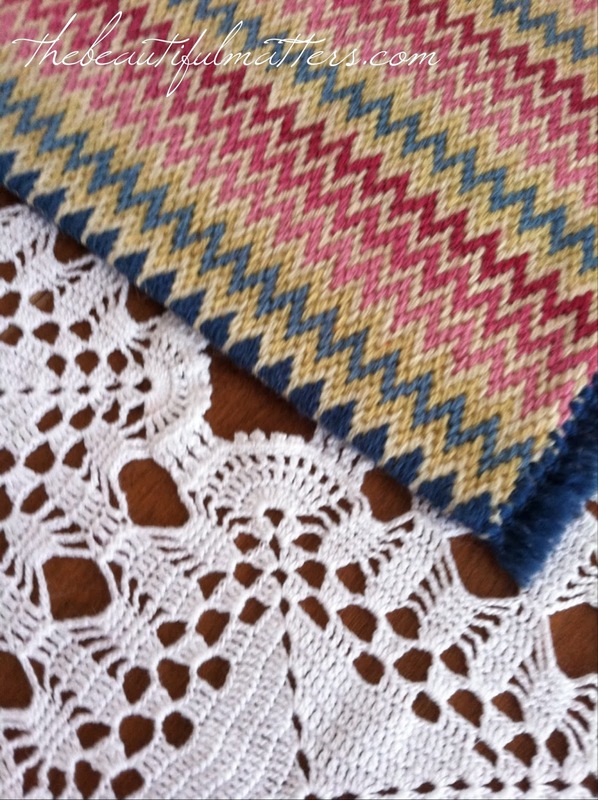 I used this piece of Bargello needlepoint embroidery as the base for my centerpiece. It is actually a "rug" that my grandmother made for a dollhouse I have. I have been referring to my maternal grandmother so far. But I don't want to neglect my other grandmother Sarah, who we called "Grandma Sally." I don't have too many things from her except for some books. She worked as a librarian to support her three boys after she was widowed, and gave me a set of little Beatrix Potter books that the library was "retiring." 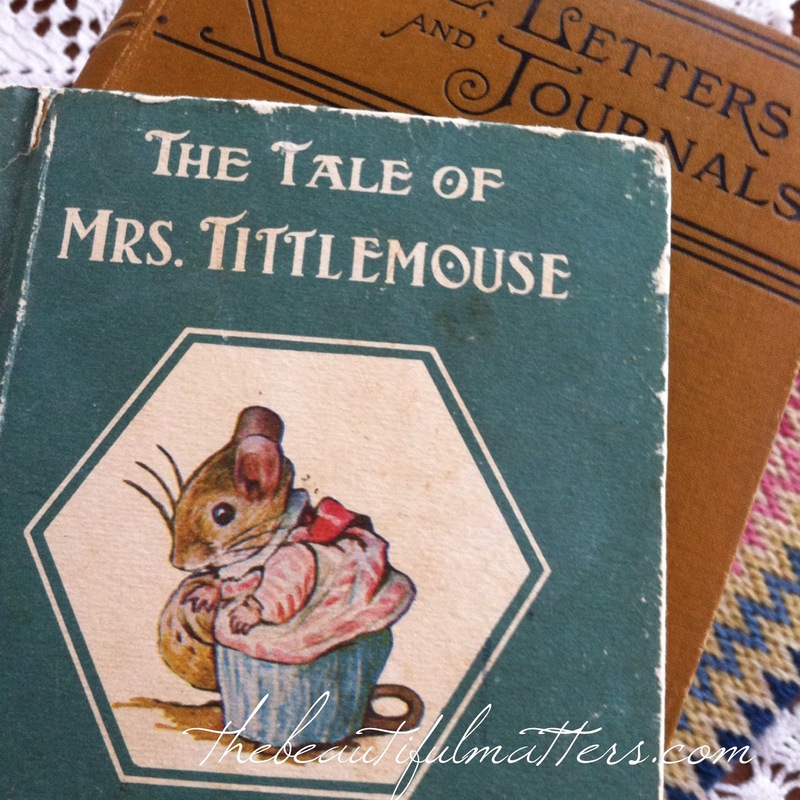 The other books below The Tale of Mrs. Tittlemouse are from my maternal grandmother. She worked as a tour guide at The Orchard House in Concord, Massachusetts, after her two daughters were grown and married. These are some of the books I got from her written by Louisa May Alcott, who lived and wrote at The Orchard House. 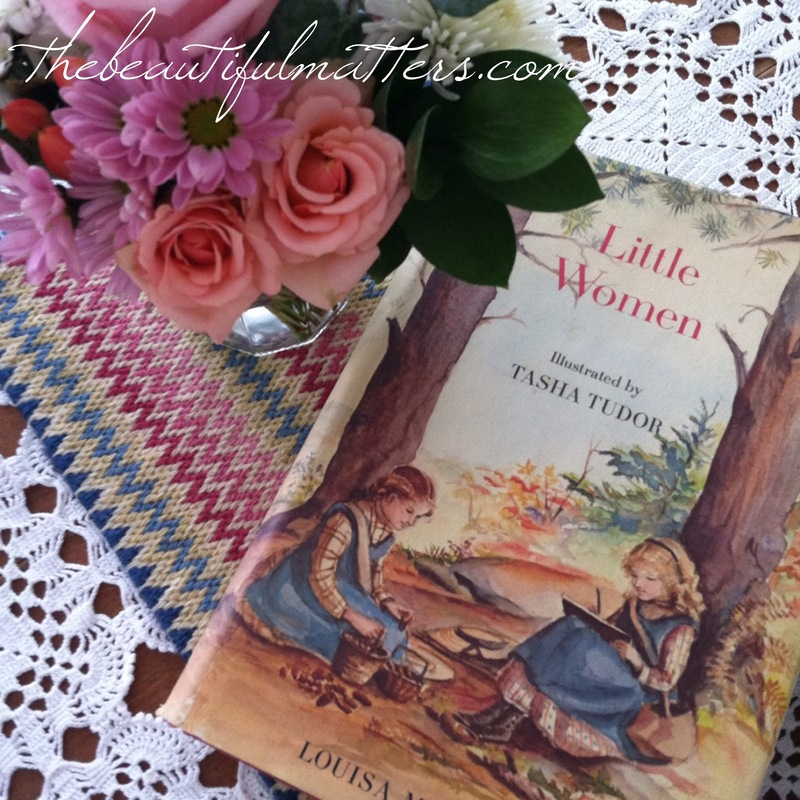 Louisa May Alcott is, of course, the author of the beloved Little Women. This is a copy of the book my grandfather gave my grandmother on her birthday in 1969. It was illustrated by Tasha Tudor. 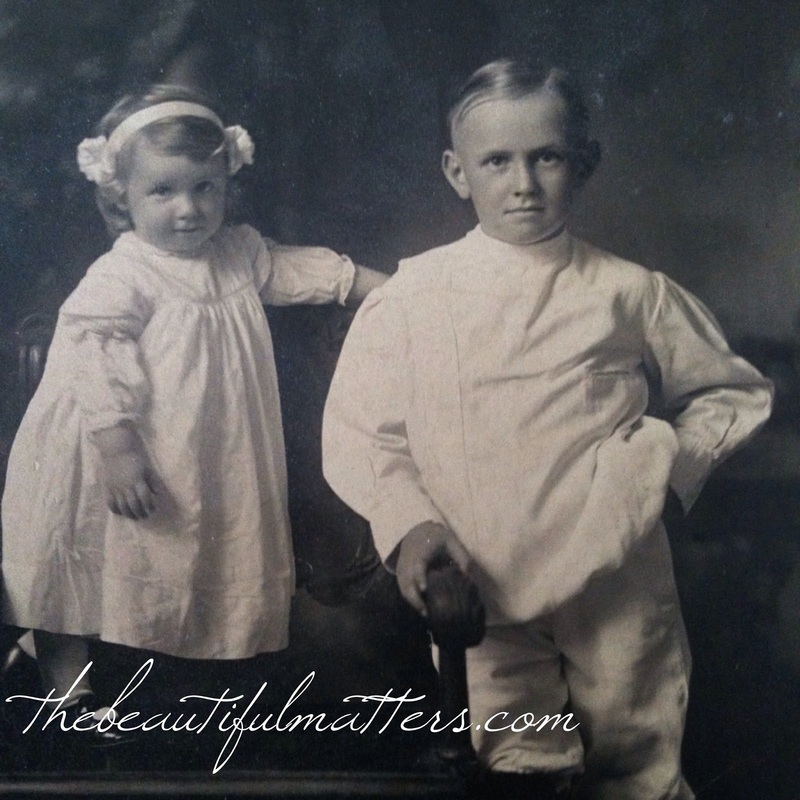 Here is my grandfather with his little sister Evelyn. This was taken before he lost all his hair to scarlet fever. He was always a little self-conscious about being bald, I think because other children teased him as a boy. And doesn't his sister look feisty even as a child? She survived two husbands and cancer, and lived to be 95. This silver, marked Towle Sterling 1937, in the Rambler Rose pattern, was my mother-in-law's. Before she was married and when she was working her first job at Dodge Main in Detroit, she would buy a piece every Friday after work. 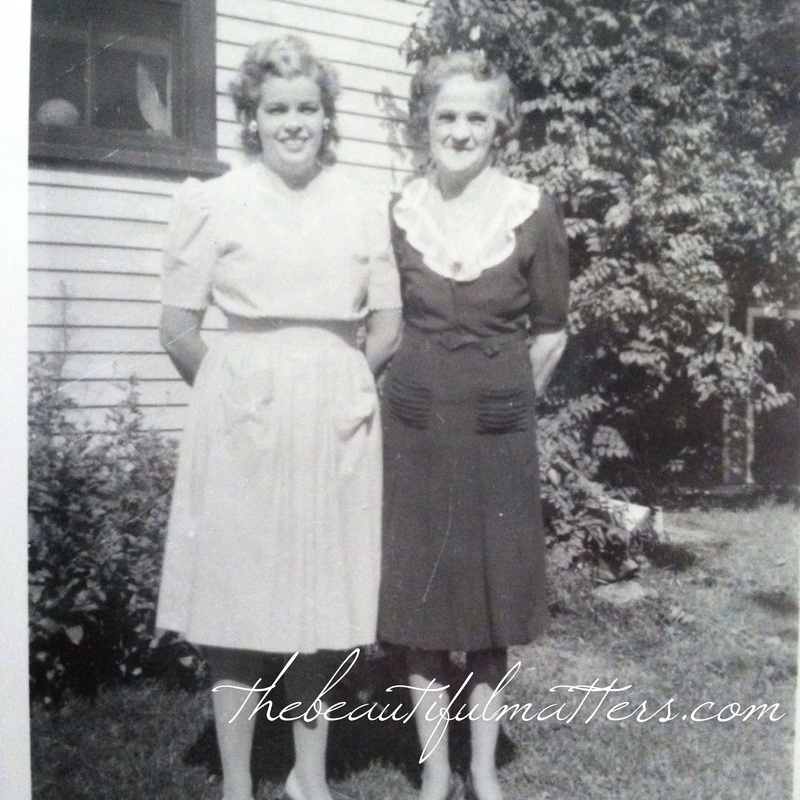 My grandmother and her mother. 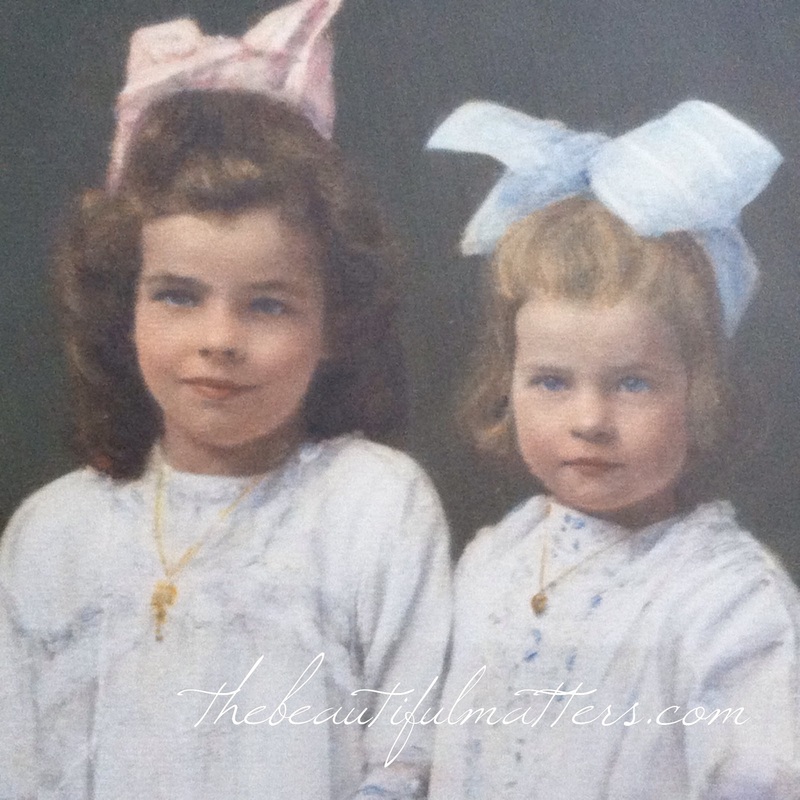 A closeup of my grandmother and her sister. Thank you for strolling down memory lane with me. These people have all shaped me in some way and are always close to my heart. Happy Valentine's Day! 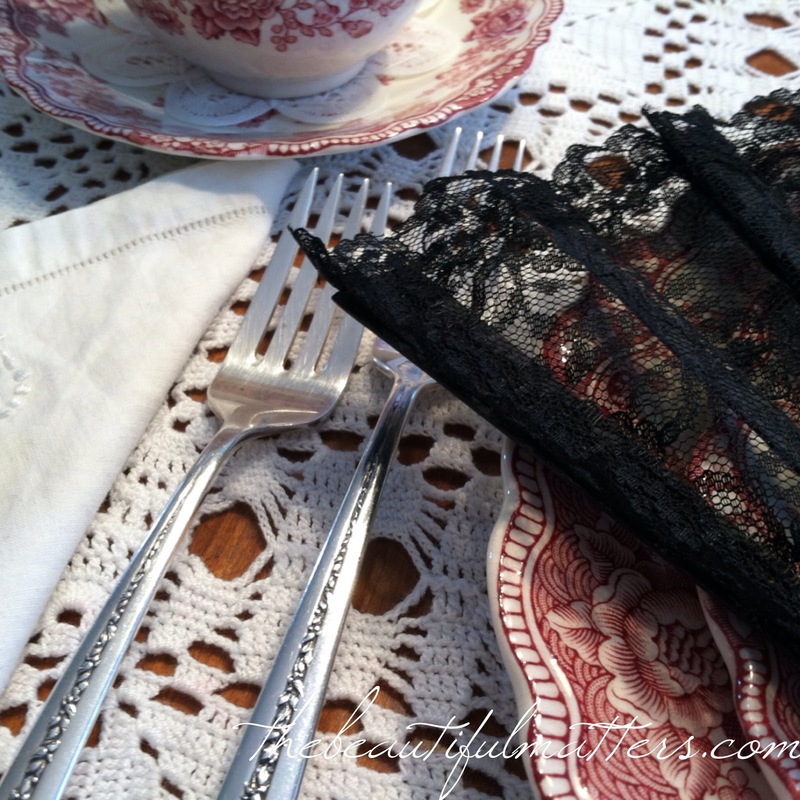 I am admiring your gorgeous crocheted cloth and beautiful Towle silverware, it looks so lovely with the Crown Ducal patterned tea cups...thank you for sharing a beautiful post. thanks Hostess. When I was young and first married I bleached this tablecloth to get out a stain. It came out all right, with a big hole! Fortunately my mother replaced the square so well I don't know where it is now. Lesson learned. Tanya, I feel the same way in antique shops, and when I see embroidered items that I know took someone hours and hours to make. I want to rescue them, and give them a home in honor of their memory. Family treasures are the best! 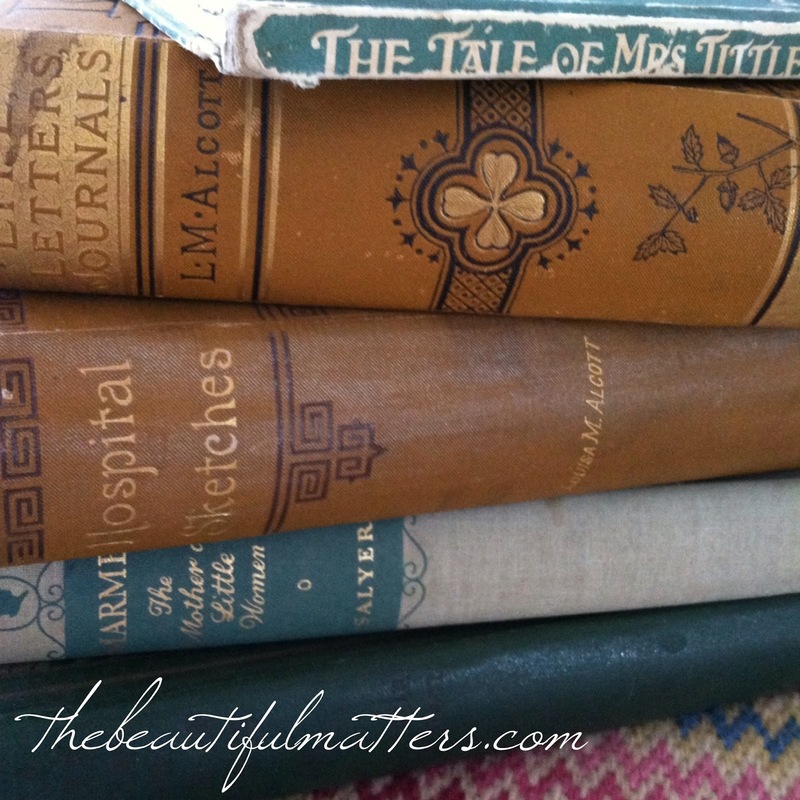 I know you feel blessed to be the caretaker of these lovely heirlooms! What wonderful photos! "Caretaker" is a good word. Of stories and memories too. thanks Tricia. How wonderful you have so many family keepsakes. I enjoyed seeing the photos of your family. My grandfather also lost his hair due to scarlet fever when he was a young man. The ladies in your family were so beautiful and the children adorable. I really like history and genealogy and found your post interesting. thank you Sandra. I have many old photos and need to get them in frames or in scrapbooks. They are our history. What beautiful memories! You are so fortunate to have all these lovely treasures for I have so few. 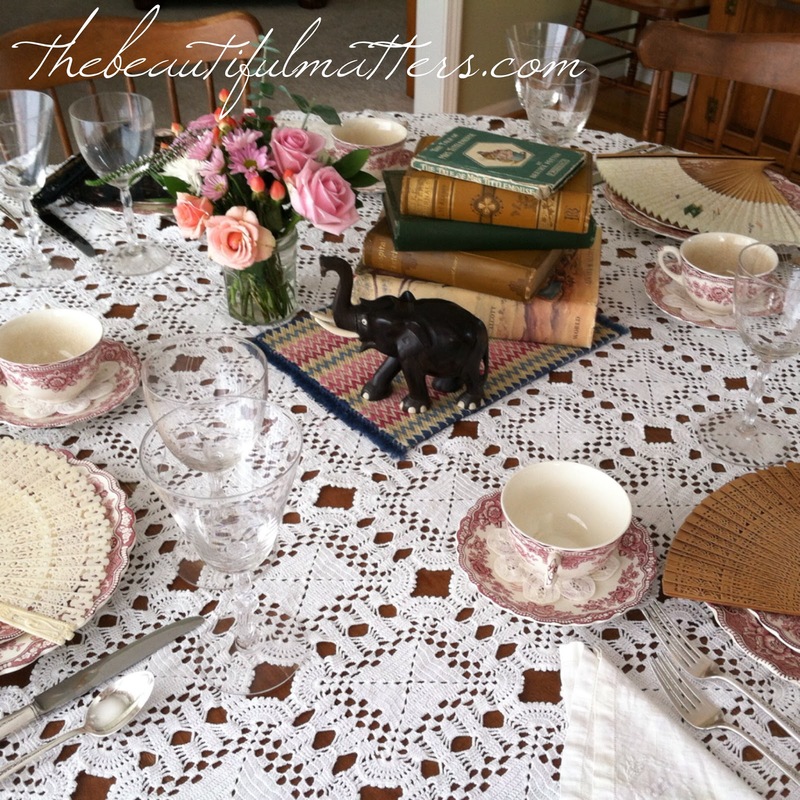 The china and silverware are my favorites for I love collecting items for the table. The photos are especially charming! 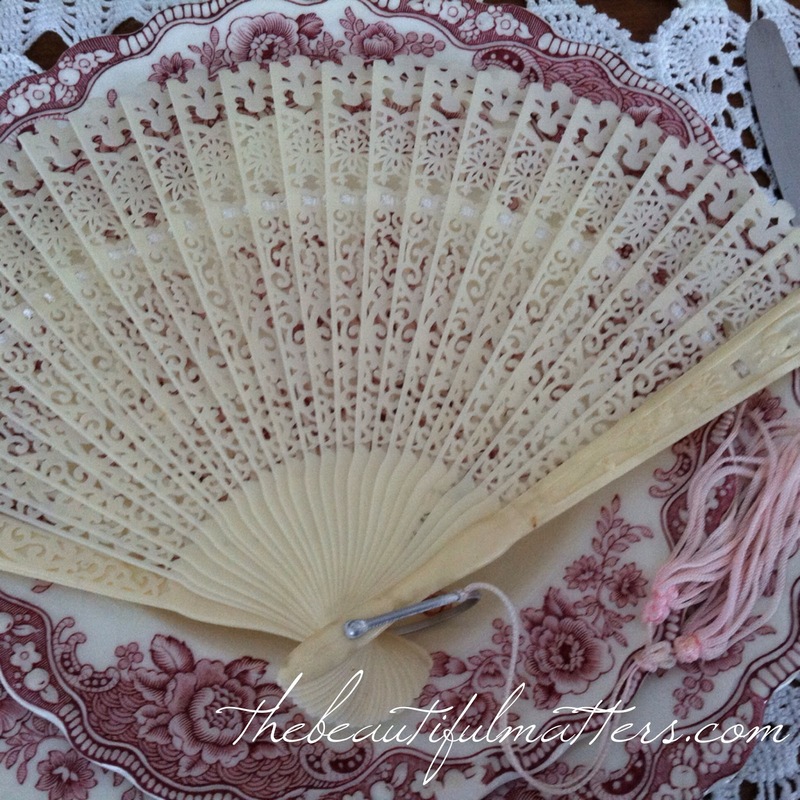 Hope you will take a peek at my Valentine's red and white table for you might enjoy it! thank you, Pam, I'll be sure to visit. Wonderful memories and photos. Your crocheted tablecloth is beautiful...I can imagine the hundreds of hours sitting crocheting it. Love your red transferware. Have a wonderful weekend, Deborah! You're right about all those hours and hours. And she made many, many things. Someday I'll post a picture of the crocheted bedspread. I am absolutely squealing with delight! I adore old photographs and you have truly set a meaningful table. Thanks so much Laura. I have many old photos that I need to get framed. They are priceless. 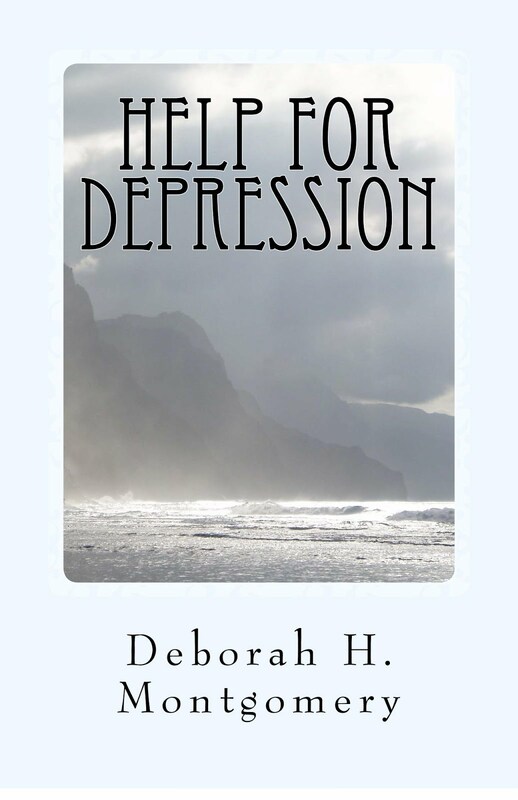 Great post, Deb! I l know how much you cherish your family's memories and what a great tribute to remember them on Valentine's Day. It is almost haunting how similar relatives of years ago look to those who carry on their name today. Andrew's eyes are definitely Grandma Jean's, and you are surely a mix of Grandma Elsie and Ruth! Happy Valentine's Day, friend! You are so fortunate to have those lovely family photos. I thoroughly enjoyed looking at each one - the dress, the hair. 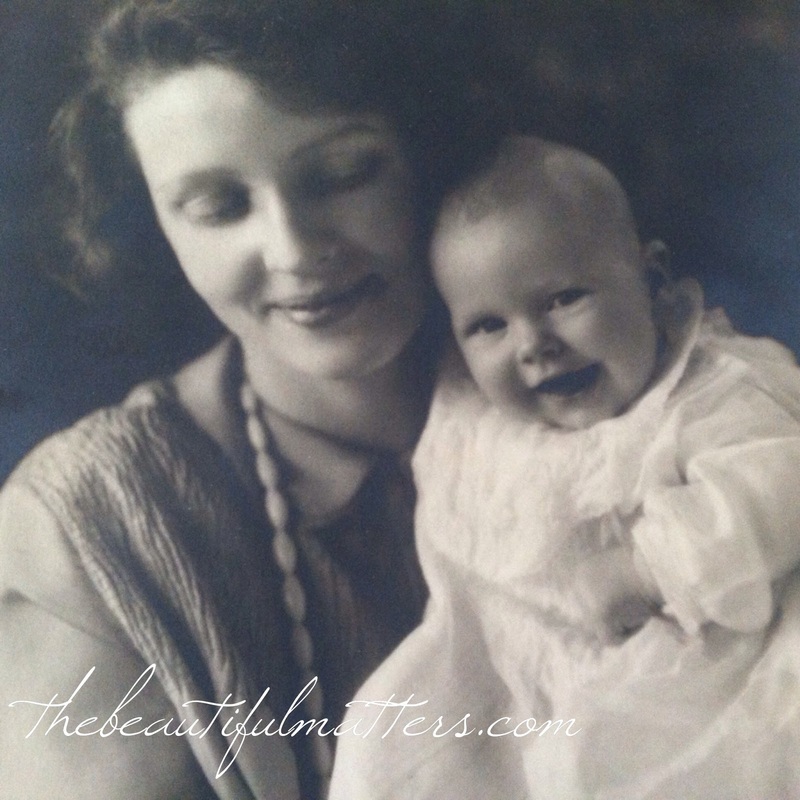 The photo of mother and laughing baby daughter is precious! Oh, as one who lives with inherited "treasures," I am completely charmed by this. Jean was a beautiful lady...all of these people are beautiful. And the things are just things, but the memories they raise are the very stuff of life itself. Thank you for showing them. It all makes for a beautiful table. 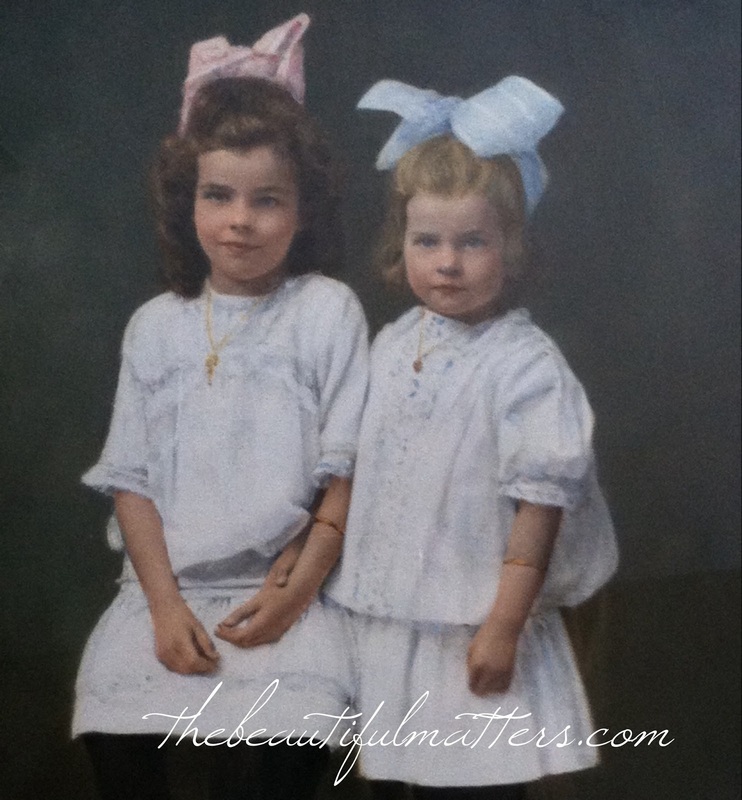 What beautiful memories to share with us and a lovely post. Jean was gorgeous and I am glad she didn't end up in Montana. She's from Scotland, huh? That is where my Uncle (dad's side) has traced our family roots. 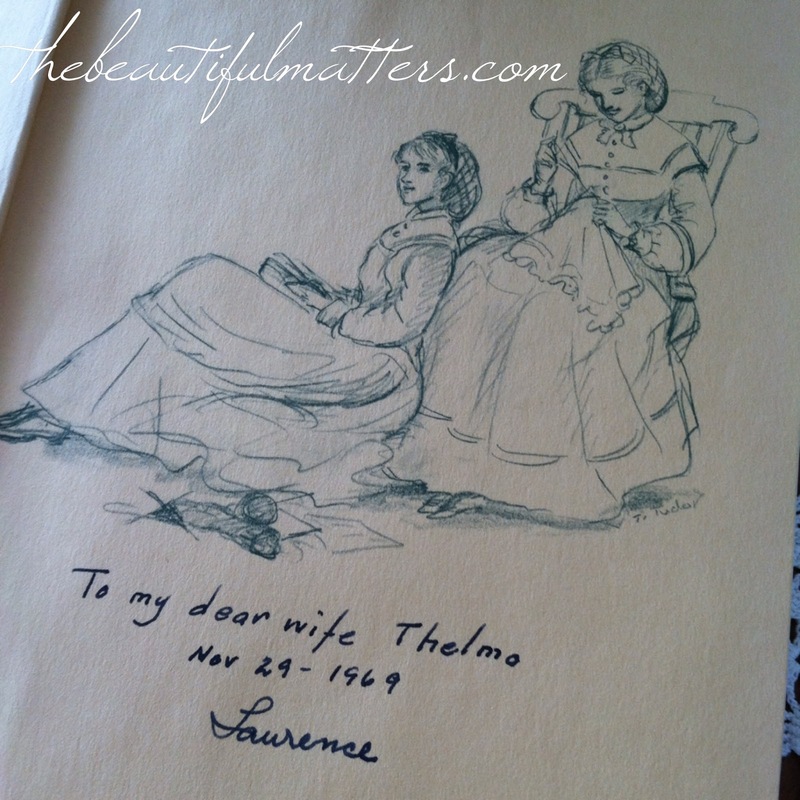 What is more, I had a Grandmother named Thelma too (I wear her wedding band)! I love your copy of "Little Women". How special to have Tasha Tudor's artwork in it. And that elephant...LOVE! 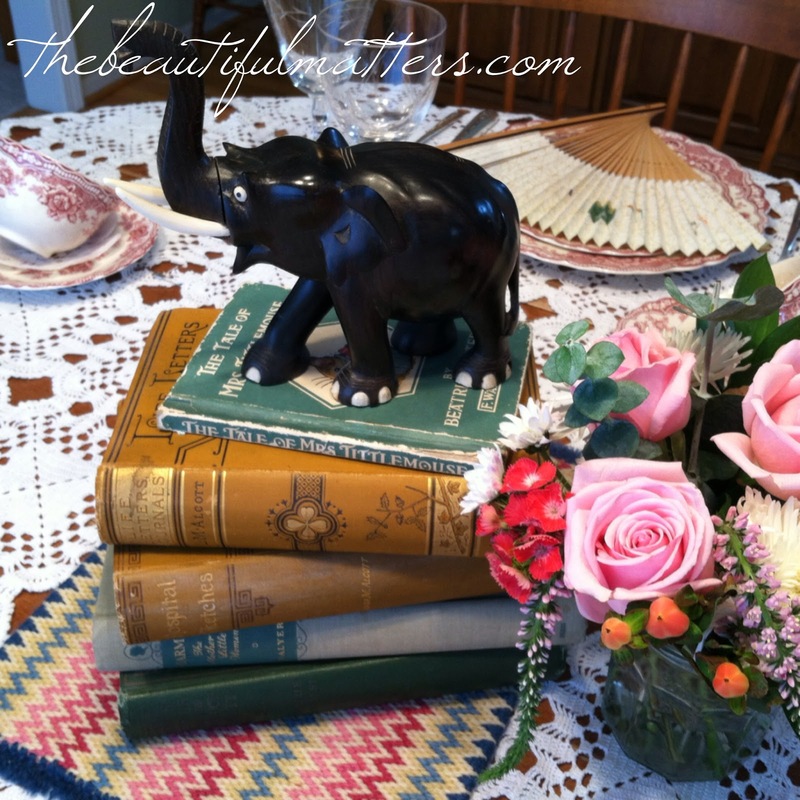 I have a big thing for elephants lately and I just bought an elephant about that size to have in my living room (you can see it in my post today). Not to mention I bought a couple of foreign coins with elephants on them to fashion into a necklace. Just love them!